Join the discussion on our forums! Come discuss Bwonsamdi, the Dead over in our dedicated Bwonsamdi, the Dead discussion topic. I've just realized this guy's based on "El Barón Samedi" (Baron -> Bwon; Samedi -> Samdi), which is the actual "loa of the dead" in Haitian Vodou religion. The missing key to the legendary weasel tunneler deck. Here is the deck for him. What do u think about it? The problem with this card is that to make use of it, you need to stuff your deck full of 1 cost minions to get value from it. Which means you'll either need to start the game with a weak deck full of trash minions, or contrive some way to add a bunch of high quality 1 cost minions to your deck. 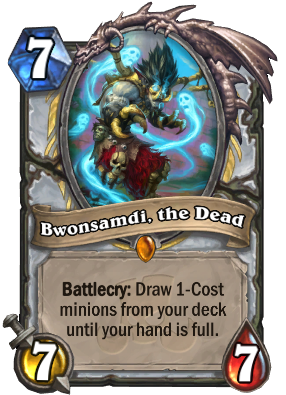 Spirit of the Dead is the only card that Priest can play which has that effect, and it is heavily dependent on getting minions to stick on your board before you can play it, then trading them in. This is a really long-odds combo, and without further support, I don't see it being worth the 400 dust you can get by disenchanting it. A deck i am running is essentially quest priest, coupled with the 2 mana copy a card to your hand spell and mirage caller, and of course, the spirits and bwonsamdi himself. What i try to do is have at least two spirits on the board, and if they dont have any sourt of aoes then you can just infinitely cycle taunt minions like lich king or obsidian statue. Not rlly effective, but its fun to pull off. got him, what deck should i make? today i tried out the new cards and there was this priest formula Deck which was insane. bwonsamdi and Spirit of the dead together is just bonkers.especially with keleseth and surrender to madness. I think Firebat said it best when he asked whether someone would play a War Golem that draws...the answer is yes. Drawing one drops late in the game in priest is not the same as drawing the top card of your deck. I hope it ends up being good, but I don't see what deck it would fit in. This Idea might be a bit stupid but I'm starting to think about charge priest of all things. So you need to have a lot of charge minions, in order to combo them with spirit of the dead or summon them all via Zerek's gallery. Than you trade them, play this guy and next time around this time you go face with them. Theoretically possible. I can personally say that out of 10 times I play two Acedemic Espionages, 10 of them will give me 1 Bwomsamdi and 19 spells and weapons. His artwork could be WAYYYYY COOOLER !